Home › Culture › ethics & philosophy › More confected fat-baby epidemic panic? The “increasing trend” that isn’t. More confected fat-baby epidemic panic? The “increasing trend” that isn’t. This supposed ongoing upward trend in birthweight has been used as an excuse for absurd levels of inductions of labour and skyrocketing C sections, and a springboard for blaming lazy, old, fat, neglectful mothers for the “obesity epidemic”, childhood cancer, asthma, diabetes, cats and dogs living together – you name it, someone screams “Inflating babies!”, and points the finger. We all “know” that the population is getting bigger fast, and that overweight babies are something we should be chewing our fingernails about. We are supposed to be freaking out over where the numbers are going to be in five years, ten, twenty, if we continue on what we’re told is the current upwards course. 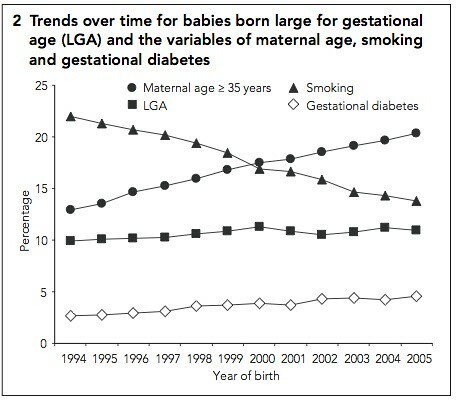 There is an increasing trend in the proportion of babies born LGA [large for gestational age], which is only partly attributable to decreasing maternal smoking, increasing maternal age and increasing gestational diabetes. This paper’s argument is predicated on that so-called upward trend – which, when you dig deeper, is actually an increase in the percentage of LGA babies between two time points: 1990 and 2005. Let’s have a look at Figure One, the one that purports to show this “increasing trend” in large birthweight babies. The one that the panic is about. 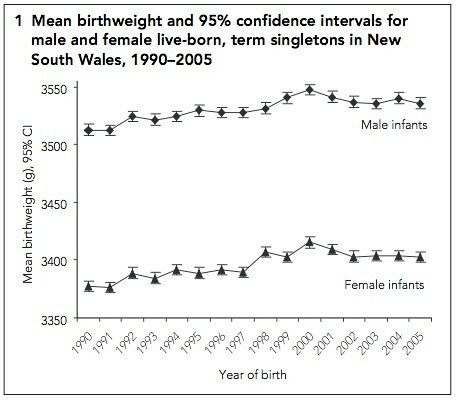 The table shows the mean birthweights for male and female live-born term singletons in NSW from 1990 to 2005. The mean birthweight rose from 1990 to a peak at 2000, from about 3510 to 3540 for boys, and from about 3375 to 3405 for girls (these numbers are eyeballed; the data isn’t included.) In the old language, that’s about an ounce. A good part of that increase, though not all, is attributable to decreasing levels of maternal smoking – as the authors note. After the year 2000, the mean birthweight FELL. Significantly. Down to about 3525 for boys, and 3390 for girls. Then it plateaued. For the past four or five years, there has been no noticeable change, and definitely no trend, in mean birthweights for either boys or girls. But if you just read the abstract, which is as much as the vast majority of people who will quote this paper will ever read, you’d think that was a progressive or accelerating increase. Can you see a progressive trend in those LGA figures? Again, I see a very very slight rise to the year 2000, then a drop, then wobbling around a static-looking baseline. There are no confidence intervals marked. We don’t know whether any change in LGA numbers is statistically significant. [ETA 19 Mar 09]: Just to make things perfectly clear, we’re looking at this line. These are the numbers we’re supposed to be panicking about. The percentage of babies being born LGA (Large for Gestational Age). This is the figure we’re being told is going through the roof. This is the FAT BABY EPIDEMIC. The percentage of male infants with birthweight 4000g increased from 14.3% to 15.8% (10.5% increase), and the percentage with birthweight 4500g increased from 2.2% to 2.4% (9.0% increase); male infants born LGA increased from 9.2% to 10.8% (17.9% increase). The percentage of female infants with birthweight 4000g increased from 8.3% to 9.5% (15.2% increase), and the percentage with birthweight 4500g increased from 1.0% to 1.2% (20.0% increase); female infants born LGA increased from 9.1% to 11.0% (21.0% increase). Note the trick of presenting the change in relative percentage, which makes the numbers look much more dramatic than when presented in absolute form. But there is no detailed statistical analysis! We are not even told whether these changes – from 14.3% to 15.8%, and from 8.3% to 9.5% – are statistically significant. What is the P value? But the newspapers have taken the relative “change” in LGA numbers – 17.9% more fat boy babies! TWENTY-ONE PERCENT more fat GIRL babies! – and run with them. Everyone, lose your head and run in circles: NOW! There were some CI lines scratched on Figure One, but we don’t know who is comparing what to who, and what the numbers are. We can’t draw an informed conclusion from them, except that it looks like the numbers in 1990 and the numbers in 2005 are probably significantly different. And to my eyeballs, it looks like the mean birthweight in 2005 is significantly different from the number in 2000 – significantly SMALLER. The only P values I can see in the paper are those applied with the adjustment protocol, not to the actual “increasing trend” that the authors are claiming as their primary result. Show me the data. And give me an analysis of the past five years. I want to know what’s happening now, not what happened in the 1990s, and then stopped happening. AUSTRALIAN babies are becoming increasingly big bundles of joy, and health experts warn it’s not always something to be happy about. […] Dr Ruth Hadfield, who conducted the study with her University of Sydney colleagues, said heavier babies had increased health risks, contrary to the popular notion that big babies were healthy babies. “For example, there is evidence of a relationship between high birth weight and the increased future risk of asthma, type one diabetes and a number of cancers, including infant and childhood leukaemia, and breast, prostate and colon cancer,” said Dr Hadfield. A new study has confirmed that babies are getting bigger in New South Wales. A generation of giant babies has doctors fearing the worst for the health of newborns and their unfortunate mothers. Since the early 1990s there has been a huge increase in the size of Australian babies, with one in six boys and one in 10 girls weighing more than 4kg at birth. Researchers warn a rise in obese mothers responsible for some of the bigger babies creates risks for children including asthma, diabetes and leukemia, and breast, prostate and colon cancer. Do you know a big baby? Post your comment below. Um, no. Not even close. Not even in the same suburb. Are there no remedial journalism boot-camps we can send these folks to? There is nothing to panic about. Babies did get bigger, on average. Then they got smaller, on average. Now, birthweights look about static. But that wouldn’t give us anything much in the way of dramatic headlines now, would it? And it wouldn’t attract much in the way of research funding. Good thing I don’t live there (I live in MN, USA), my babies would have thrown their statistics all to hell back in the 1970’s (and I was fat while pregnant). My daughter, born in 1972, weighed 8 lbs and was 21″ long. My son, born in 1975, weighed 9 lbs 7 oz, and was 21″ long. I was born in 1953 and I weighed 7 lbs 12 oz and was 20″ long, my brother was born in 1956 and weighed 7 lbs 13 oz and was 21″ long. I’m sure the same thing could be said for women and their babies in Australia too. I think babies may be getting slightly bigger, but it’s not because their mothers are fat, it’s because their mothers are better fed and get better pre-natal care (well, the ones who can afford it or have insurance, here in the States, anyway). When the quality of life improves, babies are bigger (not necessarily fatter, just bigger), kids are taller than their parents were, etc. But that doesn’t keep the “obesity” epi-panic going, does it. I was told by my Ob that my first born would be big because I had gestational diabetes (and the subtext was that I was fat too, although he never actually said that). So he induced at 37 weeks, I had an emergency c-section and my son was 7 pound 8. So not a big baby at all. Better stop talking about babies now, I’m getting clucky again. My first baby was 6pounds14 ounces or 3.142kg. She was 51cm long. Smallish side of average, right? Una (number two) was 10 pounds and 1 oz (4.55kg) and a surprising 58cm (22.8 inches). I am about five foot high (150cm, about the same as Kylie Minogue) and my weight before pregnancy was somewhere between 50 and 55kg. Una was late and just before she was born I had a warning, well two actually. First was my mum telling me that her mother had had two babies a daughter first (my mother) who had been smallish side of average, a second (my uncle) who was over 9 pounds. My mother in law had a similar tale. While she (and all her children) had been fairly lightweight, her mother had gone on to have big babies, at least one over 10 pounds like Una. In my case I am absolutely certain it was genetic. The media reports on this are flowing in, and I have a bruise on my forehead! This one at “Medguru” is headlined “High birth weight may be harmful, study reveals”. The study didn’t look at outcomes. None of them. It wasn’t about harm. The “evidence of harm” that they quote is stuff from the discussion, which the authors pull from elsewhere. This study contributed nothing to our knowledge about any links between birthweight and outcome. This one is at AFP: “Australian babies getting bigger, study finds”. Even the study itself didn’t find, or claim to find, that birthweight increases were attributable to maternal obesity. But an obstetric spokeman put his oar in to blame fat women. Michael Permezel, spokesman for the Royal Australian and New Zealand College of Obstetricians and Gynaecologists, believed higher rates of obesity among pregnant women was behind the phenomenon. “It really is a community obesity thing and related to activity during pregnancy and diet during pregnancy,” Permezel told Melbourne’s Herald Sun newspaper. And now, that link is “common knowledge”, because someone read it in the paper, and a doctor said so. Emergency services have introduced special “mega-lift” ambulances in New South Wales state capable of handling patients weighing more than 180 kilograms (397 pounds). Undertakers also say they are stocking massive coffins, while consumer authorities are considering upgrading standards on everything from toilets to child car booster seats so they can handle heavier loads. You know why we have bigger child carseats now? Because we’re moving from a system where any child over the age of 12 months can legally be in an adult seatbelt, to a system where children should stay in carseats or booster seats until they’re nearly pre-teens. Strangely enough, companies are (finally, and foot-draggingly) starting to cater for the market demand. Re car seats: you are now required by law to have any child under 4 in an approved forward facing car seat, the ones with the five point harnesss, and children between 4 and 7 must be in an approved booster seat in the backseat of the car. A child under seven can only be in the front seat if all the seats in the back are taken up with children under the age of seven. So there is a huge range of weights to cater for there. If we go the way of the UK, kids up to 12 will need to be in approved booster seats. h-jg… That was pretty brilliant. Mythically giant fetuses fetishized by the media and blamed for rising obesity rate covers a lot of bases. I don’t even think that fat shaming babies and their mothers for producing them is really that unconscious any more. It lends itself well to the trend of trying to schedule every birth by induction or c-section, ’cause you know… the babies, they are giant. Jill’s last blog post..OMG TEH BABEEZ R HUGE! Is that law yet, Mindy? I thought it was still in the discussion phase. And h-jg, great comment! It is interesting to contemplate at what point large children have the finger pointed at their mothers (because it’s rarely at their parents), and at what point the blamers start deciding it’s the children’s own damn fault. How does that switch occur? I doubt it’s a straight switch! Let’s not forget that mothers are still to blame for everything their adult children do, including various heinous crimes, as well as their social behaviour. I suspect up to the age of seven or so, it’s purely the mother’s fault, and after that it’s the child AND the mother’s fault, up to and including their entire adult life. Men, of course, don’t parent. I haven’t read the wholepaper and probably won’t, but shouldn’t the issue be not the average ( I’m too lazy atm to check if the paper refers to simple average, mean, median or something else. The “average” punter doesn’t realise there are a lot of different averages.) but whether there is an increase in the percentage of outliers up the “solid” end? I thought it was law, but my source is a newspaper article, so it could be wrong. Mindy: as far as I know, the newspapers announced that everyone supported the introduction of such a law nationally about a year ago, but it hasn’t actually come in yet. Ah, yes, Kidsafe has the goods. The RTA (NSW) site still says children under 12 months so it looks like it hasn’t been done here yet either. Hey, to link the carseats back to the baby size bizzo – guidelines and laws based on kid age are a complete pain if your kid happens to be a (perfectly healthy thanks very much) outlier. Mine’s long leggies didn’t fit in the rear facing restraint at 6 months. The rules really ought to reflect the research – which as I understand it relates to height (because that’s what influences where the belts sit on a person). Guidelines I’ve read in the past usually focus on weight, but again, if your kid isn’t average weight for their height, that’s misleading. I haven’t read the wholepaper and probably won’t, but shouldn’t the issue be not the average ( I’m too lazy atm to check if the paper refers to simple average, mean, median or something else. For that graph, it’s mean. It says so on the graph. In the post. No need to go to the paper. Though it’s only three and a half pages; you’re welcome to read draw your own conclusions. The “average” punter doesn’t realise there are a lot of different averages.) but whether there is an increase in the percentage of outliers up the “solid” end? Those data are in the post too (percentages over 4000g and 4500g), though they were only presented in very brief form in the paper, and there is no year-by-year breakdown . The shift in the normal distribution of birthweight was not a complete upward shift. The distribution shifted disproportionately, with a greater increase at the high birthweight end. Between 1990 and 2005 for both sexes, the 25th quartile increased by 15g, compared with 25g for the 50th quartile, 35g for the 75th quartile and 40g for the 90th quartile.ing rate of gestational diabetes. Of course the >4000 g group will gain more grams, if there is a general upward shift. 1% of 4000g is 40g; 1% of 2500g is 25g. We’re not presented with percentage data and a statistical breakdown; we’re expected to take the authors’ word for it, and they haven’t exactly inspired confidence so far. Mine’s long leggies didn’t fit in the rear facing restraint at 6 months. If it’s just the legs, it’s not a problem at all. There is no significant danger to the child to have legs touching the seat or bent/folded against it. When the head goes above the safe area on the rear-facing restraint, or the weight exceeds the rear-facing limit of the seat (12 kg for the better convertible restraints), that’s when to turn. Within these limits, rear-facing is safer than forward facing. Unfortunately, there’s some sort of bizarre competiparent trend in some groups in Australia where parents start boasting about how they’ve turned Little Johnny already, such a grown-up boy he is, and why haven’t you? Why are you treating your child like a baby, eh? *grumble* It sorta reminds me of the Weaning Wars. Getting back near topic – there was a whole lot of wrangling about height vs weight vs age when the new laws were being discussed, in the draft regulatory impact statement. Pages and pages and pages of it, with lots of biometric data and such. (The summary of the pros and cons are on page 45.) So the folks writing these laws aren’t unaware of the issue. In the end I believe it came down to how to put out a clearly understandable public health message, and how to enforce it effectively. Which is why there are planned exemptions for outliers who truly can’t obtain appropriate carseats. Weight estimates by ultrasound are notoriously inaccurate, as the first commenter seemed to imply. Too many doctors today are inducing early because of a “big baby.” Unless a baby is freakishly large, there is no reason for this. A woman’s body will rarely grow a baby that’s too big for her body. lauredhel your analysis of these issues is a breath of fresh effing air. What cheeses me off (well, among other things) is that this sort of analysis is accessible to millions of folk. I don’t make any pretence to doing anything fancy like getting obscure difficult-to-obtain journals and digging up the original datapoints and re-analysing them in complicated ways that require a stats PhD. Any journalist or commentator with a halfway decent basic education, literacy, a modem, and time can do this. But almost no one can be bothered. This is a question from a position of ignorance: are tall women also likely to have heavy babies? I am 193cm tall (and weighed 4.5kg at birth, I name and shame myself! ), and never come across any studies of birthweight that seem to think this is a relevant factor: that the weight of newborns should be constant regardless of their height (or their parents’) and all babies over 4kg are equally concerning (to the extent that concern is even merited). Thanks for the post Lauredhel, although I do hope one day to see some moderate conclusions with balanced reporting in this space! This is a question from a position of ignorance: are tall women also likely to have heavy babies? Yes. Also more likely to have larger babies (on average) are adult mothers, and women with adequate food, and women who don’t have severe health problems (such as pre-eclampsia or hyperemesis) during pregnancy, and possibly women who don’t have to do heavy manual labour or prolonged occupational standing hours during their pregnancy. Also more likely to have larger babies (on average) are women who stop smoking or drinking during their pregnancies. Remember that scourge of low birth-weight babies that everyone was worried about before? The last decade or two saw the social norms about drinking & smoking change, so one would expect an increase in baby weights over that period. Reflecting that better infant health, right? It’s all no win. Everything’s a crisis. Adding to this: though some results are conflicting, it’s also possible that another factor associated with higher birthweights on average is access to adequate dental care. Australia could do a whole lot better in this regard. Also more likely to have larger babies (on average) are adult mothers, and women with adequate food, and women who don’t have severe health problems (such as pre-eclampsia or hyperemesis) during pregnancy, and possibly women who don’t have to do heavy manual labour or prolonged occupational standing hours during their pregnancy. So if babies were getting bigger that would be a good thing, because it would suggest women were getting healthier, right? Oh wait, I forgot. It doesn’t matter if women are healthy, as long as they don’t have the FAT!!! Grrr.